Although some of us do not face it , the bathroom still remains a very important part of a home, because it offers you full intimacy no matter how many people are in the house. That's why it's likely you come up with new ideas while taking a shower instead of brainstorming at your desk. Creating a nice decor for your bathroom can be very expensive and time consuming, so I thought to give you a hand with this DIY, by showing you how to make your own bathroom decorations, that can be personalized to fit your needs and surroundings and most important -at a very low price. I chose to make my decorations using blue shades to remind me of the ocean- and to create a peaceful and relaxing decor. What you choose is up to you! Maybe you are more relaxed surrounded by rainbow colors or even black and white. Use your imagination and don't forget to have fun. 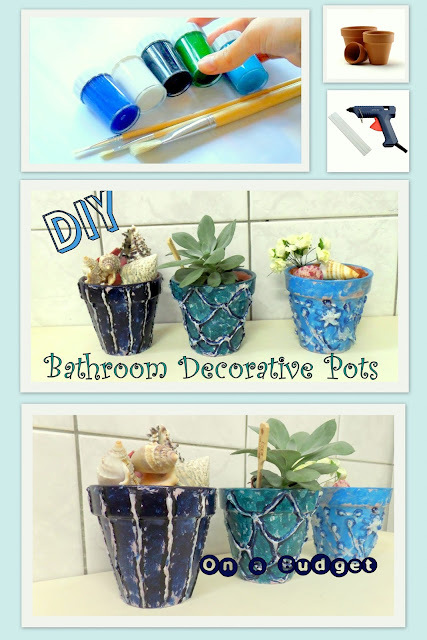 1.First step is to create some 3D elements using your glue gun . Just apply glue on the pots with strokes , randomly or following a pattern. I chose to create lines for the first pot, wired fence pattern for the second pot and randomness for the third pot (dots,lines,flowers). 2.Next add a coat or two of white paint on all of the 3 pots, covering also the glued part. 3.The fun part ! 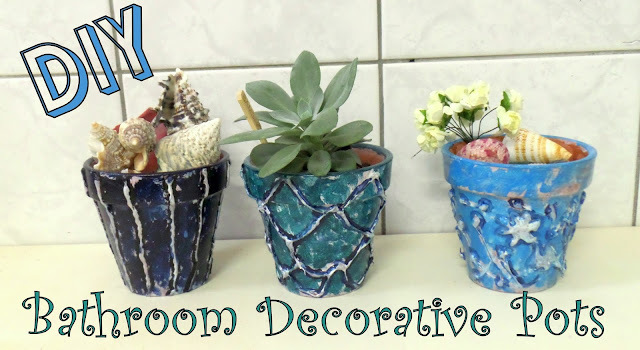 paint the pots in any color you like , avoiding the glued parts.Those must remain white so they can stand out. 4. To enhance them more, paint their edges of the glued parts using a darker color. 5. After dried add some glossy varnish. This is optional. If you like the rocky, dried effect just leave them like that.